Here in Peru, we've found ourselves on a number of treks: through snow-capped mountain ranges, desert canyons, and the Amazon jungle. Before everyone, we gathered information and debated about how we might be able to do it safely on our own. In each case, trekking with a guide turned out to be comparable in price, or even cheaper than doing it ourselves. So, after deciding to go with a guide, we made a goal of going about it the most ecologically-friendly way possible. Tourism is guilty of having laid waste to much of the natural world. In Latin America, countries such as Costa Rica deign a blue ribbon in ecotourism, for its extensive regulation designed to preserve and protect the natural habitats that millions of tourists visit each year. It's neighbor, Panama, newer to tourism to its islands and coasts, has far less regulation. The upshot is local people tearing through shallow coral reefs in speed boats so tourists can chase dolphins (this was my experience in 2009). What is “ecotourism” exactly? It is socially responsible travel to fragile or protected habitats.. As an alternative to commercial “mass” tourism, ecotourism designs to educate the tourist about the environment, to support conservation programs and to the empower the people of the communities visited, rather than exploit them. By and large, ecotourism throughout Latin America has a long way to go. While been conscious of carrying out our trash in areas where we know trash might be thrown into the nearby river, for example, we've been unable to produce no garbage ourselves. Organic materials that should be composted are generally thrown into the trash as well, unless there are pigs around. Unfortunately for people's general health and for the ozone, trash of every kind is generally burned. So one measure we have found somewhat effective is recycling plastic bags. A word on the plastic bag phenomenon here: if you buy beans at the market, your beans will be put in a plastic bag, followed by another small plastic bag, and then a bag with handles to carry the beans. No matter where you go, anything you buy will come in a little plastic baggy, and no matter how many times you declare “No, gracias ya tengo!” and wave your own plastic bag in the air, vendors will still bag and double-bag. So we've gone to every market equipped with our own, fighting a seemingly losing battle with the plastic bag manufacturers of Latin America. With dozens of vendors selling bagged meals on buses, countless bags of garbage are tossed out of the windows on every bus ride. The only upside of plastic bags, T.L. points out, are that fewer to-go containers and Styrofoam cups are being consumed here. Across South America, certain tours function under the guise of “Ecotourism”. 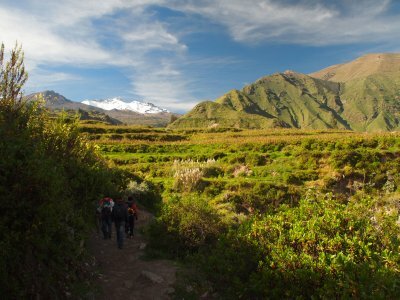 We decided to go with one such agency called “Ecotours” of Arequipa, in order to visit the Colca Canyon. And boy, did this guy talk up his “ecotour”: his Eco-conscious tour guides would be sure to carry all trash out of the canyon, and we would stay in sustainably designed eco-huts along the way. We gave him the benefit of the doubt that there might be some more eco-friendly practices about the tour we would discover later on, and so chose his tour at a higher price than the other mainstream tours offered. 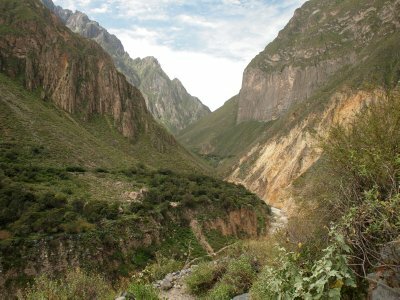 Upon arriving to the canyon, we were shuffled among hundreds of other tourists to form a group of 8 people. Our guide, who we were assured would speak English, spoke not a word, and had apparently not guided this trek much before. It turned out, we were not on an eco-tour at all, as our guide wasn't even familiar with the “EcoTour” agency. After he realized we were interested in the environment, he began to point out plants, making up names and facts about each one. 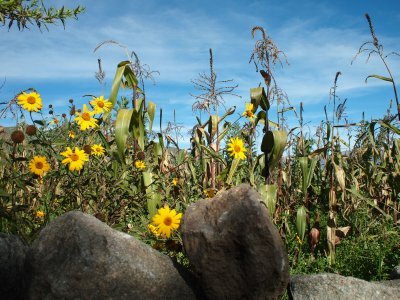 Finally, after misidentifying some of the most common plants in Peru, I assured him it was alright that he didn't know about the plants, but that he please stop inventing stories. While he was a nice guy, he was unable to answer a single question we had the entire trek. He did manage to point out a field of corn, and describe how it is used here: it is eaten, a lot, in many different ways. 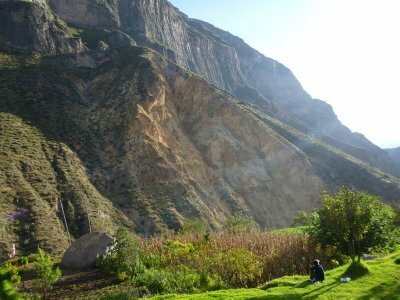 Suffice it to say, we didn't learn much about the environment in the Colca Canyon, nor did we notice any ecologically friendly measures being taken along the tour. 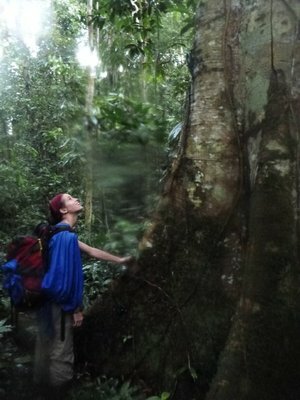 Our EcoTour of the Amazon went a lot further to earn its designation. We came into the tour because we were couchsurfing with David, a guide with many years of experience, who began leading his own tours called “Descubre Costumbres” (Discover Customs) a few years ago. David, having family out in an Amazon river community, has been working to bring awareness to the problems of deforestation there. 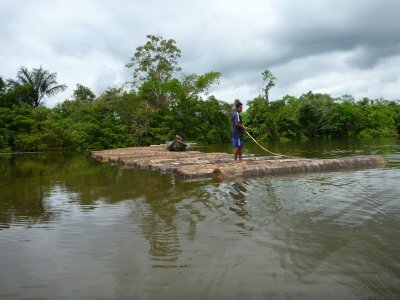 One of the more common practices contributing to deforestation in the Amazon today is the practice of cutting down and smoking logs to create “carbón”, or charcoal, for energy use in the cities. It is a filthy practice, characterized by all of the official corruption and land abuse you can imagine. 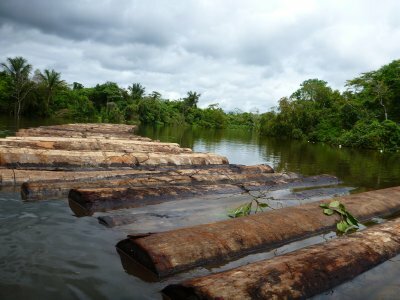 Then of course, there is your traditional felling of huge amazonian trees for construction. We had a chance to witness all of this in action: there's little attempt made at hiding it, nor is it controlled. It was not the big, mean, corporate power dressed in black coming in to deforest... it was local people, looking to make money quicker than they otherwise might growing and selling plátanos. 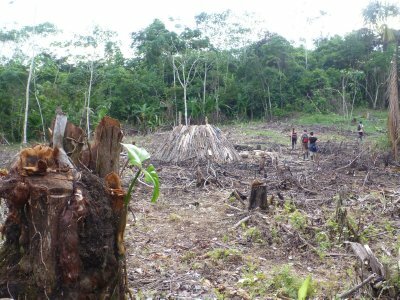 In less than a week's work, people turn a profit clearing hectares of forest for carbón than farmers will earn in years of selling their produce. Still, while the effort at awareness was present, practices along the Amazon river do not look to be changing anytime soon. To convince people that saving the environment is more important than quick cash in their pocket is a hard sell, considering many people down here cannot get by without immediate remuneration. David, our guide, was also well informed about many other ecological issues of the land and the water, including climate change and the record-high flooding in amazon villages that had caused a state of emergency in Iquitos and the outlying areas. I am happy to report, aside from our time in the Amazon, I have not noticed any horrific signs of environmental destruction in the areas we have visited. Still, the pure volume of people traveling to certain sites, continues to degrade the habitats and historic sites so widely visited here. Its a really nice and insightful post! ENjoy the rest of your travels.